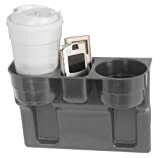 The Seat Wedge Cup Holder Sits In Your Seat Wedge And Has The Ability To Hold Two Beverages And A Compartment For Assorted Items. Custom Accessories, the leader in Automotive Aftermarket Accessories, is a”One-Stop-Shop” for ALL your Automotive needs. From Interior Accessories, Exterior Accessories, Car Care, Steering Wheels Covers, Compasses, Tire Gauges, Air Compressors, Car Organization, Car Comfort, and countless others CUSTOM ACCESSORIES has it all.